I'm currently working on a full size top hat (a story for a future post!) for customer Rick in Canada for his upcoming wedding. He sent in a question about how to wear his new hat that is of general interest to gentlemen: how to reduce the incidence of 'hat head'. 'Hat head' is what happens your hair gets messed up into a weird shape under your hat, and holds that shape when you remove the hat. It might take one of many forms, including flattened hair, a line pressed into the hair where the sweatband has gripped it, or a cone of hair that's formed by the hat pushing the hair upward. Luckily, ladies don't have to deal as much with hat head, as discussed in this previous post. But for the guys, it can be a concern, especially at events like weddings where you'd like to look your best, but where etiquette requires that you remove your hat and put it back on throughout the day. Everyday hat wearer John Martinko offers some ideas for minimizing this hair-mussing phenomena. 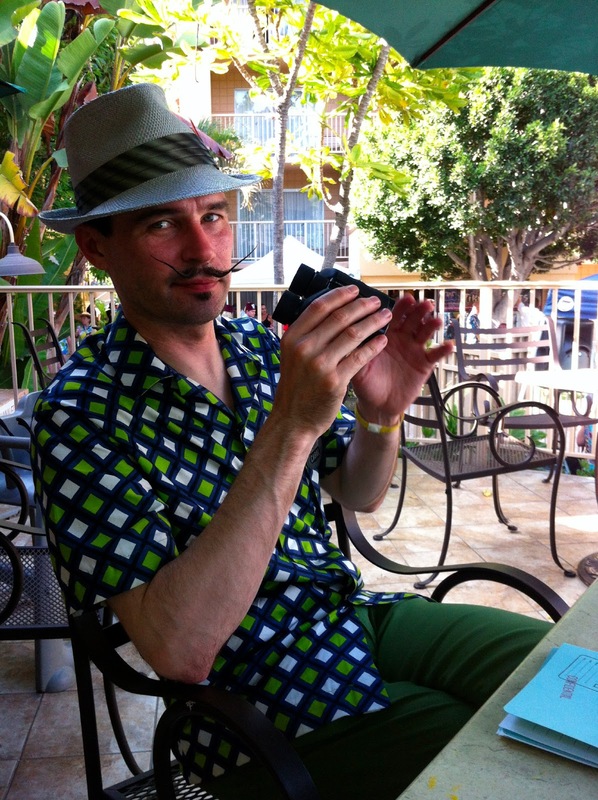 Here's a photo of John wearing one of his many House of Nines Design hats at Tiki Oasis 2012. Avoid greasy hair products like pomade, hair mud, or styling cream. It will flatten the hair down when a hat is put over it, and leave shiny spots where the hat has touched it, making the hair look even flatter. Never put a hat on a wet head. Clean hair is less likely to develop hat head, but make sure your hair is dry before putting your hat on, or it will dry under the hat extra flattened. Short hair with some stiffening product in it is the most foolproof. If you keep your hair short, there's less of it to flatten. Stiffening products like little bit of gel or hairspray can make hair more resilient and less likely to smash down under a hat, and more likely to spring back to shape when you take the hat off. If you wear hats often and have longer hair, consider switching to a thickening shampoo and conditioner that will give your hair some extra body. Don't move the hat around on your head while you're wearing it. This will disarrange the hair and give you something similar to bed hair. When you take the hat off or put it back on, do it in a simple motion that doesn't spin, scrunch your hair up or smoosh it around as you do it. Remove the hat occasionally to give your hair some air. If you feel like your head is getting sweaty, remove the hat to let your head cool down before replacing it. Run your hand through your hair to fluff it up, and/or think about carrying a pocket comb for quick touch-ups before photo time. John says that he usually follows the basic rules of guy hat etiquette that say that you should remove your hat when seated to eat, and when you're inside, like when sitting at your desk at work, and this offers plenty of hat-breaks to keep his hair aerated. Adjust the hat size. Consider wearing a hat that is slightly small. John prefers his hats to be sized about 1/4" smaller than his actual size, putting the hat in contact with less of his hair. But you have to wear a small hat a little bit high on the head (preferably at a jaunty angle for style)- if you're wearing a small hat pulled down tight onto your head, that will mash your hair even more than normal. On the other hand, a too-loose hat will shift around on your head when worn, mangling your hair underneath. Mass market hats that are too tight or too loose are common problem. Unlike off-the-rack hats that come in a limited range of sizes, a custom hat from House of Nines can be made to the precise measurements that are right for you. Get the correct hat shape for you. Everyone's head is uniquely shaped. Although most people have a head shape that's close enough to the standard oval hats are usually made to, many people have heads that are hard to fit- peanut-like shapes, lightbulb-like shapes, rounder than average heads, or long and narrow heads, etc. etc. etc. Here at House of Nines, we've seen them all. There's nothing wrong with this natural variation, of course, but it may make fitting into a hat a bit more challenging. This is especially true for men's hats, which are usually stiffer than ladies' so correct fit is even more of an issue. Just like with shoes, the size may be correct but if the shape is wrong, a hat may be uncomfortable. This may cause you to move the hat around as you wear it, trying to find a comfortable position, and it may cause there to be areas where the hat presses more tightly on your head than others, flattening your hair in those spots. Custom hats can be made not just to your head size, but also to your exact head shape. See this article about our custom shaping service. Wear a hat appropriate for the weather. A warm felt hat may make your head sweat on a warm day, matting your hair down under it. Try a straw hat with a leather sweatband on warm days, or a straw hat with a fabric ribbon sweatband for the hottest climates. Have any other tips for avoiding hat hair? Let us know. Thanks also to Gail Colombo and Aaron Noble for contributing some tips for this post.